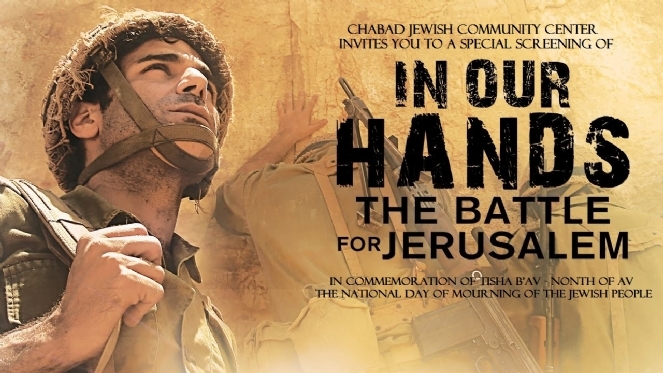 "In Our Hands: The Battle for Jerusalem!" Service and Torah Reading 5:00 p.m.
Bring your Tallit and Tefillin, if you have a set. If not, we will provide you with a pair. The fast of Tisha B'Av begins at 7:51pm on Monday, July 31 and ends at 8:18 pm on Tuesday, Aug 1. Tisha B'Av is the saddest day on the Jewish Year, the Jewish National Day of Mourning, where we mourn the many tragedies that our nation has endured throughout the generations. From the Spies and the wandering of the Jews for 40 years in the desert (1313 BCE), to the destruction of the Holy Temples in Jerusalem and our exiles from Israel (423 BCE and 69 CE), the Bar Kochba rebellion (133 CE), the Crusades, the Jews being expelled from England (1290 CE), the 1492 expulsion of the Jews from Spain, World War I beginning on this day (1914), to the modern day horrors of the Holocaust. All of these events weigh heavily on our minds on this day of tragedies. Yet the message of Tisha B'Av is one of hope. A nation that has gone through such great suffering, but still survives and thrives and continues to fervently hope and pray for the coming of the righteous Moshiach and the end all suffering and pain, is truly a story of an eternal people. Join us for a moving evening of reflection and hope for the future.